More 2 stars chefs here. Other French chefs here. 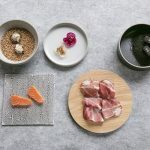 A French chef prizes the dedication of regional producers as he travels Japan to find the best ingredients for his two-star Tokyo restaurant. Born in 1981 near Lille, Northern France. He was interested in cooking since he was a child, and gained admission to local cooking schools from the age of 15. For four years, from 1996 to 2000, he dedicated his training to restaurants in notable hotels all over France. 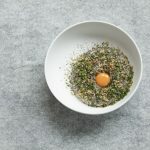 After gaining experience at famous Michelin three-star restaurants in Paris, including “L’Arpège” (Alain Passard), “Ledoyen” (Christian Le Squer) and “L’Ambroisie” (Bernard Pacaud), he obtained the post of chef at the restaurant L’Agapé (one star). In 2011 he spent one year working in French restaurants at “Tateru Yoshino Ginza” , “l’Art et la manière” e.t.c. in Tokyo. At this time his appreciation for Japanese cuisine grew. 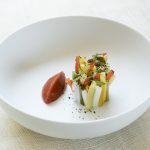 On returning to France, he started at “Troisgros” and was appointed Executive Chef of “Cuisine[s] Michel Troisgros” by Michel Troisgros in August, 2012. He has been influenced by Bernard’s work at L’Ambroisie and also Michel Troisgros in his work. He is always thinking on how to create and recreate the culinary experience and he is passionate about wine and travel too, just like Michel. Based on traditional French culinary techniques, the cuisine of Michel Troisgros is characteristic for its gentle mouth-filling sweetness interspersed with delicate and refined acidic notes. Ingredients are exquisitely accented by citrus, vinegar, olive oil, herbs and spices enhancing the flavors. 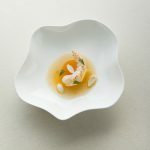 Michel Troisgros believes that his customers deserve only the finest treatment and, to this end, uses only the freshest ingredients carefully selected from Japan, while drawing out the rich flavors of ingredients to the fullest in his dishes. Cuisine[s] Michel Troisgros has been open at Hyatt Regency Tokyo since 15 September, 2006. From the beginning this French restaurant has been overseen by renowned chef Michel Troisgros fostering a long-standing relationship with Hyatt Regency Tokyo. Michel is the third-generation owner-chef of “Troisgros” in France, which has enjoyed a three-star rating in the Michelin Guide for 49 years. 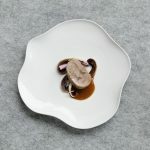 Bearing the name Troisgros one can expect the fine tradition of French cuisine continued from “Troisgros” in Ouches to enrich Tokyo’s gastronomic scene, but by adding the [s] to cuisine in the name represents the plurality of international cuisine particular to this restaurant. The name reflects the philosophy of embracing a diverse palette of flavors. 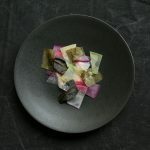 And dishes beyond the classical French cuisine embodying his profound culinary style sculpted by the years of travel and influence he has collected from around the world.